Final Fantasy 8 Soundfont Progress. NOTE: You will probably need SFPack. Get ithere. How I'm going to do this, I really don't know. But none the less, I just thought I should point this out before I get emails complaining to me that it doesn't work in Windows Me. Alright. Well, maybe 2 people have expressed interest. I've been waiting half a year. Wow. :) I've decided that since I've been shown a lot of appreciation for working so hard on this earlier this year, and that since no one really wants to help me out and that it's not really worth it, I don't feel I should waste my time with this when I could be doing other things that could pretty much help further my future, as it were. If you want to be a part of salvaging this product, please, let me know. It would be nice to actually know whether or not someone wants this thing. I can't do it myself. And please, I'm not going to wait another half year for an answer. You must be easy to work with, and you must accept my way of designingit. (In otherwords, I've got a certain setup for a reason. 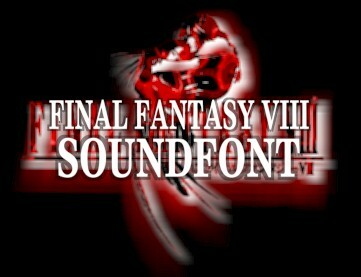 This isn'tfor soundfonts or GM compatibility, this is so we can replace FF8pc's actualmusic system. This is the main priority. Oh yeah, despite the recent e-mail I received from a certain "fan", Merry Christmas. Note: Go to theDOWNLOADS page and check it out! Final Fantasy 8pc DEMO Music System Patch RELEASED!! Soundblaster Live! (atleast 20 mb allocated) or Soundfont 2+ compatibility with software synth.